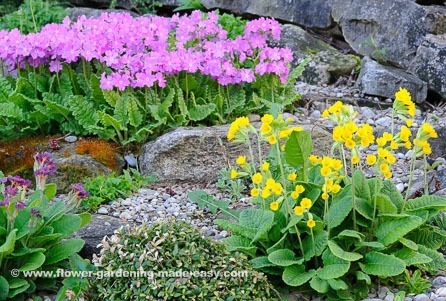 Primula (which is their botanical name) can be challenging to grow, but they are worth it for the exquisite flowers. Many species thrive only in cool, moist climates, but there are other species that will grace shady bog gardens, woodland plantings, rockeries or flower borders. Well drained, but moist soil suits many types, however, a few have lower moisture requirements. Many are hardy in the north to USDA zones 3-5, but only a few will grow in the south to zone 8. As garden plants they are not long-lived, but some self-seed freely and others can form large colonies. Primula is a huge genus with over 400 species, further broken down into 30 sections. The most common types in gardens are Auricula, Candelabra, Denticulata and Vernales. One genus of the many in each of these sections is described below to give you an overview. Primula auricula – Auricula Primrose:These plants are strong growing with broad leathery leaves and sturdy 2-8 inch stems holding heads of handsome, fragrant bell-shaped flowers in shades of yellow, purple, red-brown and lavender. They bloom in the spring and some forms may have a natural white coating on the stems and leaves. They are not difficult to grow, but require organic soil that drains well and contains a moderate amount of water. They are shallow rooted, so winter protection is necessary to prevent frost heaving. Can be grown in zones 3-7. P. japonica – Japanese Primrose: This is one of the showiest and most popular Primulas. The name candelabra refers to whorls of flowers set in tiers on top of tall stems in May or June. Flower colors range from pink and deep red to terracotta with a gold center and white with a gold center. Very easy to grow, as long as there is constant moisture, shade, and boggy, loamy soil. Streamside or pondside with moving water is ideal. Can be grown in zones 5-7. P. denticulata – Drumstick Primose: These plants are old favorites. The flowers, in shades of white or lilac, are held above the leaves on 8-10 inch thin stems in early spring. The florets form a globe of color at the top of the stem – resembling a drumstick – and are one of the first to bloom in spring. The leaves are shaped like spatulas and may grow to 12 inches by summer. Give them shade and rich, loamy soil supplied with a moderate amount of water. Mulch in winter with loose material such as evergreen boughs, so the crowns are protected, but not matted down. Can be grown in zones 4-7. Primula x polyantha – Polyantha Primrose:This hybrid is widely and easily grown, and requires less moisture than other primroses. Flowers are bunched along the stem just above the leaves in spring. Flowers bloom in a wide range of vivid colors. The small leaves are an attractive dark green with deep veins. Can be grown in zones 3-8.